In UK, there’s no reason for disabled students not to pursue higher education. Despite still being very challenging to study as a disabled person, significant improvements are done and nowadays university is equally accessible to everyone. Furthermore, The UK universities are charged with legal obligations to ensure disabled students will get excellent treatment through their studies. This includes many facilities, starting from the basic things they commonly need like wheel-chair friendly routes to the social treatment they’ll get. Studying in the UK as a disabled student won’t represent any difference to studying as a non-disabled student because your fundamental rights will be protected and guaranteed by law. Universities in the UK are committed to making sure these laws are fully functional and you have a normal student life even if you’re a foreign student. Despite that, as an international student with a disability, you don’t have access to governmental funds for disables students in UK, your additional needs arising from your disability will be seriously taken into consideration. For example, Scottish universities have a particular loan fund to help disabled international students who otherwise are not eligible to seek DSA funds. What these rights include and why is important to know them? Education is a fundamental right to every human and so is to the disabled people. Universities in the UK are obliged to respect and make sure to fulfill these rights under the Equality Act 2010 and the UN Convention. With this being said, it is important for you to know that your right of attending university is guaranteed. Whenever there will be anyone or anything trying to deny to you this opportunity there are many institutions and many laws where you can address your concern. If a student is rejected from admission just because he’s disabled (direct discrimination). Providing application in only one form which cannot be accessible to disabled students(indirect discrimination). Discrimination springing from a student’s disability, for example, going out in breaks because it takes him more time than his non-disabled peers. When a professor shouts at the student who may have interrupted his lecture because of his disability. When a student is suspended because he had protested about being harassed. Within every British university, there’s an office and an official who’s in charge to deliver every service concerning this category of students. Disabled students can reach him for different problems and he will give instructions or help to overcome them. Here’s a way this office can serve for good to a disabled student. Universities in the UK have many scholarship schemes dedicated only to disabled students. Those who are interested to get one, but know nothing about the application process and other details can contact the official person and he will help them. If you’re for the first time in the campus of your university, the above official will show you everything you need to know about your access on campus. It may happen that around a certain building there may still be missing a wheelchair route alongside usual stairs and this may limit your freedom to move around that place. Because universities may only be required to fulfill a required limit of facilities to disabled students while their needs may seek more we highly suggest to personally contact the university. For example, a visually impaired student may need a certain set of Braille books for his course so they will work toward adding those books in their shelves. They will seriously consider any of your demands and act in accordance with it. Since disabled students may have different demands from non-disabled students they have to take additional treatment to never feel discriminated. The university and its staff must make certain adjustments to their schooling plan regarding their disabled students’ needs. This means they have to pay extra support and aid to these students if needed. Moreover, they have to take into account these students when thinking of building a new school object or modify the actual one. As we already said, the UK education system has many scholarship schemes allocated to disabled students. Financial support for them is of a great importance to make them feel equal to their non-disabled peers. Apparently, this will make attending a higher education easier for them. Scholarships to disabled students in UK are governed and provided by both governmental authorities or non-governmental organizations, including here universities. At the present there are numerous such scholarships available for disable students. 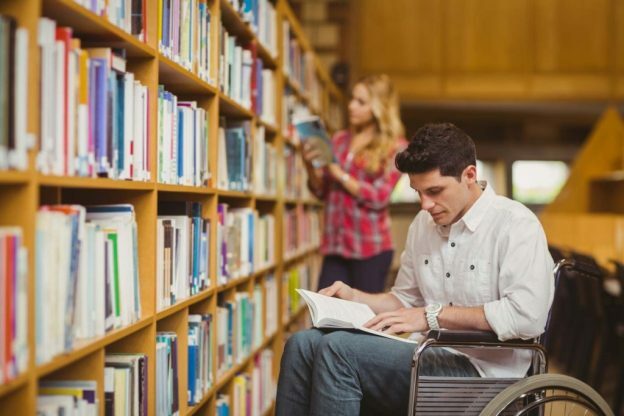 Powered by governmental funds, all UK universities run a joint scholarship and loan scheme for disabled students called the Disabled Students’ Allowance. If you’re facing extra costs due to your disability, then you can apply for DSA funds or loans. You must reach the Disability Service office in your university and of the advisers there will guide to a successful application. Your eligibility to apply for these funds depends on several factors like the type or severity of your disability, the type of your course and your nationality. The Disability Service office is in charge of sending your application to the responsible authority and then get to you after they receive an answer. Note that in your application a medical certificate that states your disability is required. How much you’ll be paid varies according to your disability-related needs. These funds will be allocated to your bank account or can be paid directly to the provider of service you’re seeking to get. An important note: Since the UK countries run DSA funds independently and are free to set up individually the details of how these funds will be provided, your eligibility and the amount you can get changes depending on what location you’re studying. For example, the DSA funds are only available to the UK students. On the other hand, the same funding programme in Scotland is also offered to EU students with disability. Also, a DSA scholarship in England covers the cost of traveling you have during your studies in UK as a disabled student. In Scotland, on the other hand, the DSA does not cover such costs, however, you can make a claim for such additional funds from the Student Awards Agency for Scotland (SAAS) .